The American oil boom is proving far harder to kill than OPEC expected. Even though OPEC has been drowning the world in oil, the U.S. pumped a near-record 9.18 million barrels per day in January, according to recent stats released by the U.S. Energy Information Administration. That's down a miniscule 0.6% from the end of 2015 and is actually slower than the pace of U.S. monthly production declines that started last year. In other words, America's incredibly resilient oil boom has not tapped on the brakes hard enough yet to fix that epic global supply glut that has caused crude to crash as much as 75% over the past two years. "The pace of declines have been tortuously slow," said Tom Kloza, global head of energy analysis at the Oil Price Information Service. 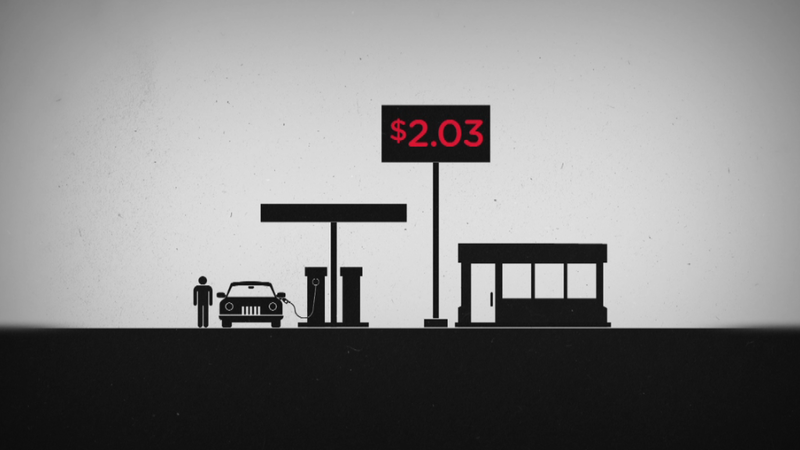 Many, including OPEC, expected U.S. production would crumble as oil prices declined sharply. The oil cartel, led by Saudi Arabia, shocked the world in November 2014 by continuing to pump aggressively in the face of oversupply. The thinking was that strong OPEC production would pressure producers in the U.S. and elsewhere that need higher prices to turn a profit. But that hasn't really been the case. At least not to the degree that would solve the supply glut. 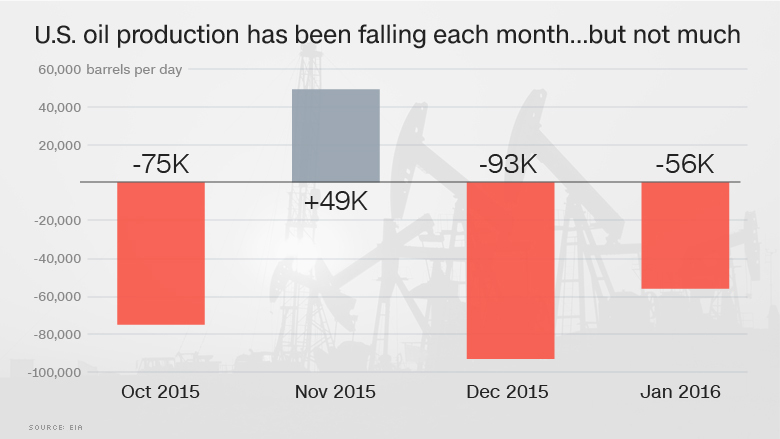 Last year, U.S. oil output did start to decline year-over-year for the first time since 2010. U.S. oil production peaked in April 2015 at 9.69 million barrels per day. Yes, it has come down in the months since then, but only by a modest 5%. "Oh my gosh, it's been incredibly resilient. It's been a much slower pace of declines than anybody projected," said Matt Smith, director of commodity research at ClipperData, which tracks global shipments. All of this has thrown cold water on the recent spike in oil prices. Crude is currently sitting at $37 a barrel, up from the 13-year low of $26.05 set in February, but below the recent peak of $41.90. "People who see light at the end of the tunnel in the second quarter for crude have some incredible vision. They must be using the Hubble telescope," said Kloza. So why has U.S. production been so resilient? For starters, U.S. shale producers have become dramatically more efficient thanks to technological advancements and price cuts by suppliers. For example, Texas' Eagle Ford and North Dakota's Bakken both had production declines in January, but oil output actually rose in the Permian Basin in West Texas. "That is the hot zone, the most fertile shale play. There are guys there making it work," said Kloza. Another driver: The Gulf of Mexico didn't get the oil crash memo. Production there in January was up another 8% from the year before and the EIA thinks it'll hit a record next year. The Gulf hasn't been responding to the oil crash because deepwater projects require enormous lead times, making them less susceptible to price fluctuations. Despite the recent resilience, analysts believe U.S. oil output will continue to slowly decline in the coming months as more production comes offline. It's just not clear how much, though. This situation raises the bar on the highly-anticipated summit in Doha on April 17 between Saudi Arabia, Russia and other global oil producers to discuss a freeze in output. But will that be enough to fix the global glut, given resilient U.S. output? Capital Economics doesn't think so. "Freezing output at current high levels would simply maintain the excess supply that is now in place and, as such, would not be a game-changer," Capital Economics wrote in a recent report.